Okay, we admit it. We’re on a tart craze. Okay, Melinda is – Chancer can almost thaw out frozen pies successfully. 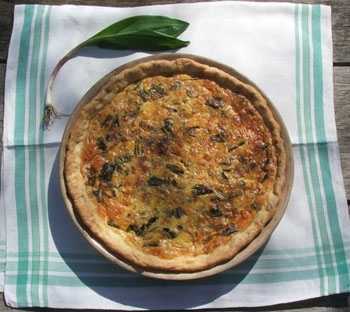 So here is yet another ramp tart recipe for all those ‘pie people’, out there. 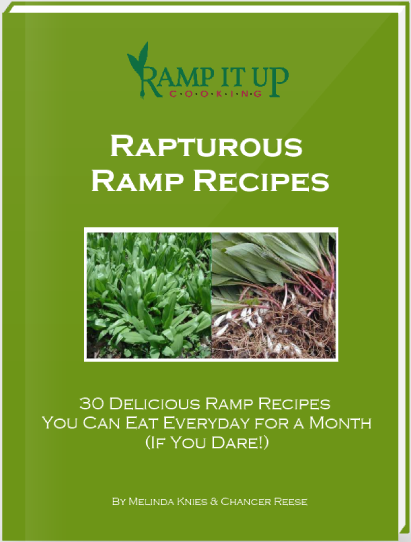 Assuming you beat the chefs to it, choose fresh ramps with bright leaves and firm stems. Cut off the roots and rinse the leaves, then chop them up and sauté them in a little butter. Sauté the mushrooms and shallots in olive oil for about 8 minutes, until the mushrooms give up their juices. Add chopped ramps and cook, stirring, for five more minutes. Let the mixture cool. In a large bowl, whisk eggs, cream, salt and pepper. Stir in Parmesan and grated Gruyere. Add the mushroom-ramp mix and stir to combine. Line a tart pan with pastry and pre-bake for 10 minutes at 350 degrees. Remove from the oven and raise the heat to 400. Pour the mix into the pie crust, and bake for about 30 minutes, then reduce the heat to 325 and continue baking for 20 minutes, or until the top is golden. Allow the tart to cool for a few minutes before serving. It’s good at room temperature, too.